The largest lake in Italy, Lago di Garda is a popular vacation destination. Relax on some of its beaches, or try out some watersports, such as sailing or windsurfing. Venture further into the countryside surrounding the lake for mountain biking, trekking, climbing, horseback riding, or golf. Visit some of the charming towns around the lake. Bardolino boasts some old churches, and the ancient, fortified town of Sirmione offers a balance of historical sites, shopping destinations, and restaurants. Make Lago di Garda a centerpiece of your Garda vacation itinerary, and find what else is worth visiting using our Garda trip planning site . I have walked, ran and cycled around roughly half of the Lake. It is amazingly beautiful here at times. Calm prevails, although it can be quite a lot of traffic around eg. Sirmione. I have not tried to swim in the Lake, although there are plenty of bad sites. To go by ferry is a great way to explore. There are a lot of campgrounds on eg. arriving with camper. Bardolino, near Verona feels quite authentic unlike nearby Garda. Great scenery! Beautiful Lake, to discover from the villages on the heights, many paths to make beautiful hikes. Really superb. Best place to drive from Venice. If you have time in Venice, rent a car & go for a drive to Lake Garda. Very calm & peaceful place with amazing weather. Loved the beauty of this place. You ll definitely start feeling jealous about the people's life style there. Try to visit near by villages & lakes. You ll love the drive between the mountains & tunnels. Stayed in Garda. A good location for getting around the whole lake. The ferry service is quite expensive compared with the bus service which is very well operated. A good way to travel is to go by bus and return to your resort by ferry. Will return again next year. Certainly a place that should be considered as one to visit or spend a vacation. Great cinematic views are mesmerizing, the water is clean and warm enough to swim and do different water activities which are available. Lots to do on the shore as well. Great place. Beautiful spot ten mins train ride from Verona station. It is everything you see in photos and the air just feels light. Nice craft stalls around, although can be expensive. We just did a day trip but will return to travel all the way around. Every day, we help thousands of travelers plan great vacations. Here are some tips on how to use your Listing Page to attract more travelers to your business - Lago di Garda. Promote your permanent link - https://www.inspirock.com/italy/garda/lago-di-garda-a79737425 - on your website, your blog, and social media. When a traveler builds a plan from this page, the itinerary automatically includes Lago di Garda. This is a great way for travelers looking for a great vacation in your city or country to also experience Lago di Garda. Promoting your link also lets your audience know that you are featured on a rapidly growing travel site. In addition, the more this page is used, the more we will promote Lago di Garda to other Inspirock users. 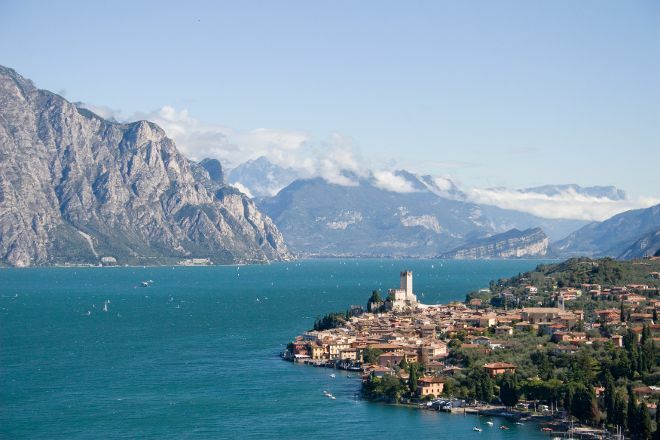 For best results, use the customized Trip Planning Widget for Lago di Garda on your website. It has all the advantages mentioned above, plus users to your site can conveniently access it directly on your site. Visitors to your site will appreciate you offering them help with planning their vacation. Setting this up takes just a few minutes - Click here for instructions.